Meet (and friend!) Trish Mayhorn, an Online Express, Raiser's Edge, and Blackbaud Merchant Services user, with Methodist Eldercare Services. She's also a new Community blogger! This week's member spotlight shines on Raiser's Edge, BBMS, and Online Express user, Trish Mayhorn, with Methodist Eldercare Services. She also wrote a best practice blog, "Successful Donor Relations" in Best Practices! 1 spectacular 17-year-old son. Junior in high school and aspiring sports journalist. 1 Heinz 57 mixed breed dog who's 70 pounds of pure love, but a bed hog. 1 gray striped kittycat who likes to talk a lot. Where do you live? "Columbus, Ohio area." What do you like to do for fun? "Read, try new restaurants, travel, garden, follow politics (at some risk to my sanity.)" What’s a life achievement you are particularly proud of? "I learned how to swim at age 35 after a lifetime of being scared of water." What’s one memory that always makes you smile? "Road trip with my mom and son to Florida." What is one interesting fact about yourself most people don't know? "I know a tiny bit of Latin, Spanish & Japanese. I love cars and I aspire to live on a houseboat someday." What are three things on your bucket list: "Travel to Ireland, fly in a blimp, take a cross-country train trip." 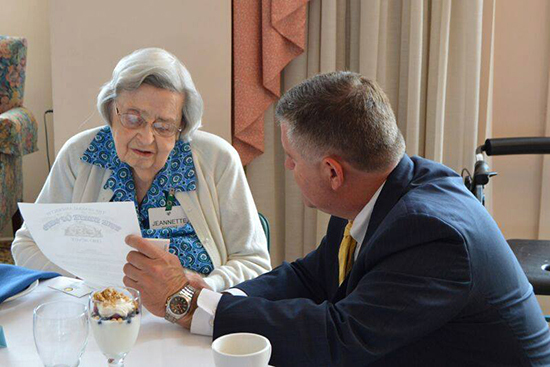 Tell us about your organization: "Methodist ElderCare Services operates three retirement communities in the Columbus area. Our communities are truly homes for our residents. There is a lot of love among residents and employees. I tell people, in all sincerity, that I would move in today if I were old enough." Our main fundraising focus is for charitable care, which comes into play if a resident exhausts his or her resources through no fault of his/her own. The need is ever-growing." What’s a typical day like for you? "Typical day? "Ha ha! Seriously, I do gift acknowledgements, donor relations (birthday cards, lunches, phone calls, in-person visits), reports, scholarship application processing & follow-through...whatever's needed." What’s the best part of your job? "Talking with our donors and telling their stories." What advice would you give someone starting out in the non-profit field? "Listen a lot and ask a lot of questions! Use the Internet to read as much as you can about your organization and others like it (annual reports, online giving pages, etc.)" What do you love about the Blackbaud Community? "The wisdom of my peers! It's priceless." Finally, if you were a sandwich, what kind of sandwich would you be? "A fluffernutter. Definitely!" Congratulations on being the member spotlight of the week! I enjoyed reading about your achievements and your work. Sounds like wonderful things are happening at Methodist ElderCare! Congratulations on your awesome spotlight. Love the advise: Listen a lot and ask a lot of questions! Use the Internet to read as much as you can about your organization and others like it. Excellent spotlight Trish! Congratulations on learning how to swim, that is quite an achievement.